House in a very quiet area, close to the city center, 3 beds of 140. House of 80m2 near the city center of Dijon. At 300m a tram stop (line 2 Junot stop). Access at 3 stations in the city center and 5 stations at the station. Access in 10mn on foot in town. For a stay with car, free and easy parking in front of the house. Closed court with small garden and sandbox in front of the house, terrace arranged on the back. Entrance, kitchen, living room with BZ, WC, bathroom and 2 bedrooms (sleeps 6) 2 TVs and internet access wi-fi. House located in a quiet one way street. In front of the house, courtyard closed and flowery in summer with a small garden and a sandbox (summer). On the back, a terrace equipped with a garden furniture with 6 chairs, 2 sunbeds, a barbecue, a children's table with 2 chairs and a table for activities for water games in summer . - Kitchen 10m2 fully equipped, oven, hob, fridge, small freezer, dishwasher, Senseo coffee maker, kettle, microwave, TV and dining area. - Living room of 30m2 with 2 sofas, 1 BZ (2 beds 140), dining area and TV. No washing machine in the rent but two laundries are nearby (plan for access in the manual that is in the house), clothes drying racks provided. Children are welcome, possibility to put at your disposal an umbrella bed, a small bath, a changing mat and a wooden high chair. - The beds are made upon arrival. At about 400m you will find a Divia point for self-service bicycle rental. Tourist tax to pay at your arrival. In the house you will find a manual with some tips and ideas for visits and outings in Dijon. Had a wonderful stay in this property, which is very convenient for transport to the city centre, plenty of shops close by. Great house well positioned for city access and local shops.Very quiet.All slept well. Dijon is beautifull. Friendly people.No litter or grafiti.Tram system easy to use.Racetrack 20 minutes away.Awsome weekend.Thanks to Chantal for letting us rent her house.Would like to go back one day. We had a lovely week's holiday in Dijon and the house suited us very well. Excellent facilities for a small child (bath, high chair, sand pit and water play!) and very close to a nice local park. Easy walk into central Dijon for all the sights and shops. Supermarket and small shops and tram stop near by. Chantal was a lovely host and very attentive and communication was fine despite my French being very poor (she has a very good translation app). The house had everything we needed and was very quiet and restful. Thank you Chantal. Merci à vous d'avoir choisi notre maison!!! Au plaisir !! Revenez quand vous voulez !!!! The property was larger than we expected, giving space for our growing kids. 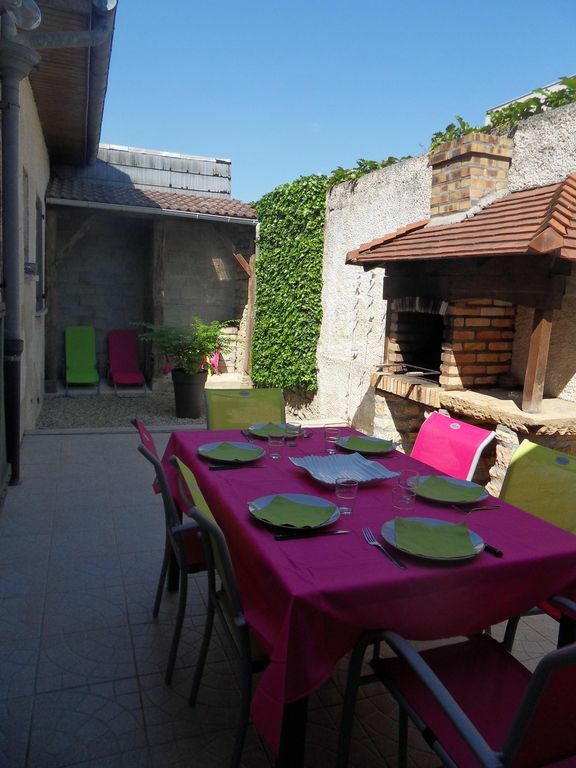 The area is residential and quiet, but only a short tram ride from the centre of Dijon. On hot days the house stayed cool, and we spent a lot of time relaxing in the shady courtyard garden. The kitchen is well equipped for family cooking. We enjoyed cycling on the Canal de Bourgogne and Canal de Centre, and on a disused railway track from Santenay to Nolay. We retreated to the Olympic swimming pool when it got very hot. The city is much prettier than I had remembered from a grey day 25 years ago, and there was more to see that we didn't get around to. The owners were very welcoming and friendly, and the facilities were thoughtfully arranged. Our teenager was comfortable sleeping on the futon - in fact, I think he rather enjoyed the proximity to the fridge! The only small frustration was the lack of a washing machine, but as we were only staying for one week, we got away with it. We were a group of 3 couples traveling together. Overall we enjoyed our stay, finding the home comfortable and peaceful, tucked away in a quiet neighborhood. We especially enjoyed our evenings eating and visiting on the private terrace. The kitchen was well stocked, except for a good coffee maker. There were 2 bedrooms that were comfortable, except no fans so it was hot at night, and the French use a warm duvet rather than a top sheet and blankets (we found this throughout France). The third couple had to sleep on a firm futon in the living room that blocked the entrance into the kitchen so no privacy. The main sights are a 15 minute tram ride away, along with amenities like cafes and groceries. So a peaceful place but have to use public transportation for everything. Also, the owner charges for towels, which we were not aware of until a few days before arriving along with the owner wanting us to bring a security deposit check for 500 euros. This we could not do and the owner was okay with that. The owner only speaks French, but luckily one person in our group spoke French. Overall, a comfortable place and we enjoyed our time here. The owner was helpful but there were a few issues that renters should be aware of. Pour les ventilateurs je viens d'en ajouter un dans chaque chambre. Le troisième couchage se trouve dans le séjour et son matelas n'est pas un premier prix et est très confortable( emplacement indiqué dans l'annonce). Il y a des commerces de proximité à moins de 300m.... boulangeries, supérettes, banques, journaux........et l'arrêt de tram. L'accès au centre ville se fait à pied en 10mn et en tram en 5mn..... (indiqué dans l'annonce également). Pour la caution j'ai vu directement avec le site. The house was perfect and only a short walk to the tram stop. The hosts were very friendly and helpful. We definitely hope to return. Merci!!! Au plaisir de vous reçevoir une prochaine fois!!!!! Dijon city center with its museums and the old town. The wine trail with visits to wineries. Enjoy our burgundy !!! Cassisim visit to Nuits St Georges. Visit the Fallo mustard factory. Fair of Dijon in November. Mon tarif est de 79 euros par nuit pour 4 personnes et 15 euros supplémentaires par nuit et par personne à partir du 5ème voyageur. Il y a 6 couchages.Les draps sont fournis.